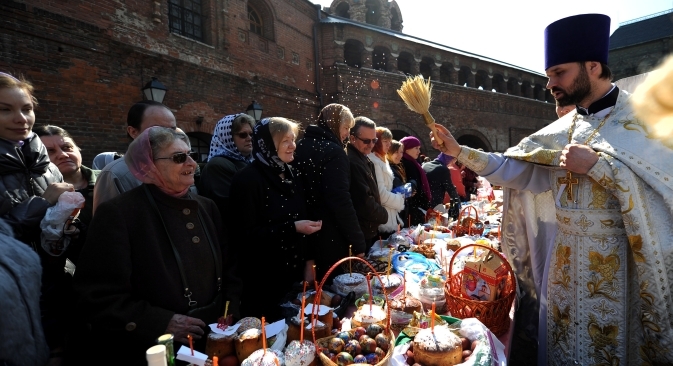 Orthodox Easter Day in Russia, celebrated using the Julian calendar, is the one of the most sacred occasions for believers in the country. Easter is called Paskha in Russian. It comes from Jewish word Pasque which means Passing with Christ to the other life. Easter Sunday is a very happy and holy occasion for Russian Orthodox Christians. You greet someone on the day with "Khristos voskres" and get a reply of "Voistinu voskres," which literally means that Christ has risen. After that it is a custom to hug and kiss three times, symbolising belief, hope and love. Orthodox Easter Day in Russia is celebrated based on Julian calendar. It often differs from Easter date according to Gregorian calendar that Western Christians follow and this year, the holiday falls more than a month after the celebrations in the Catholic world. In other parts of the world, the Sunday before Easter, called Palm Sunday, includes a procession of the assembled worshipers carrying palms, representing the palm branches the crowd scattered in front of Jesus as he rode into Jerusalem. Since Russia is a northern country and very few places have palm trees, the tradition has been adapted to prevalent botanic conditions. Russians calls the day Willow Sunday and people collect willow branches, get them blessed in the church and keep them at home. Easter signifies not only a holy time but the beginning of the spring after long winter. Russian Easter foods include Kulich (Russian Easter Bread), Paskha (dish made of cottage cheese, raisins and nuts) and eggs. The Russian Easter egg tradition dates back to pre-Christian times when people considered eggs as fertility symbols and as devices of protection. In Christian tradition red coloured eggs symbolize the blood of Christ. In Russia, there is no custom of chocolate eggs or bunnies. We colour real eggs for the celebration. The common way of colouring is by using an onion peal. The purple onions in India are not suitable for this purpose. We usually collect the outer peal from white onions in advance. When you boil eggs covered with onion peals, they get a beautiful maroon colour with different shades. You can experiment with different patterns. Put rice on a wet egg, wrap it with damp cloth and then boil. You will get nice a motley design. The modern technique of egg colouring consists of soaking them in edible colours to get various results. Nowadays in Russia, you can buy beautiful stickers that make eggs look like they are professionally painted with different religious or non-religious themes. In our family, we have an Egg Fight tradition that I think comes from Belarus. Each person has to choose one egg and hit the tip of somebody else's egg with his egg. If the shell of your egg stays uncracked, you move to another person. The winner is the one who has the strongest egg.